Renowned West Country publishers, Halsgrove, have come up with a superb predominantly pictorial collection of Somerset C.C.C's glory years lasting between 1973 and 1987 which was a period when, with two future knights, Viv Richards and Ian Botham, as well as the gigantic Joel Garner, Somerset were very much the one-day side to beat. 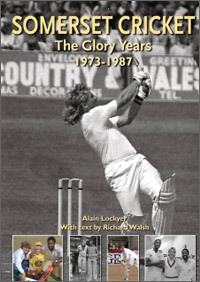 Alain Lockyer, a Taunton-based photographer for over four decades, and Richard Walsh, a freelance journalist for a similar amount of time and who has followed Somerset also throughout that time, have produced a loving history of The Glory Years which includes rare photos taken by Alain and which are now owned by the Somerset Cricket Museum. Naturally, there are a lot of photos devoted to Richards, Botham and Garner but other stalwarts of that era including Brain Close, Vic Marks, Peter Roebuck, Peter Denning, captain Brian Rose and Colin Dredge, amongst others, appear regularly. There are photos of a young Martin Crowe who first played in 1984 and Sunil Gavaskar who appeared in 1980. Some of the Lord's finals during the late 70s and early 80s are interesting: full crowds, crowds enveloping the square and field no less and the famous ground as it used to be. Historically the photos are interesting too: autograph hunters seeking their heroes even after they have been recently dismissed; festival and benefit match days; and photos with sponsors all make this an excellent record of a champion county in a different era even though it was less than forty years ago. I suspect that one photograph of "Ace wicket keeper Trevor Guard (sic) " looks dangerously like Peter Denning but, this apart, the book is an invaluable record and highly enjoyable. It is in fact similar to one brought out in the 1980s by my former school teacher, Vic Marks, called Somerset County Cricket Scrapbook, a book which featured more of Somerset cricket's history, which was written by a player. A very decent player too and an England one. Alain Lockyer and Richard Walsh's book, concentrating on the more recent golden days, is seen through the eyes of a photographer and journalist and both obviously thorough Somerset fans and their love of the county shines through. All great eras come to an end and the release of Richards and Garner, which caused such controversy and led to Botham's departure for Worcestershire, is also given coverage at the end of the book. An end to a glorious era but these days, even without the silverware to show for it, Somerset is proving that further glory days and years may just be around the corner. They field an exciting team, have a strong membership and I, for one, am always very happy to see them do well.